In this cross-sectional study, two-thirds of Fracture Liaison Service (FLS) patients had comorbidities and medications associated with increased bone- or fall-related fracture risk. Bone-related and fall-related fracture risk (BRR and FRR) were associated with age and fracture type, but not with gender or BMD. Systematic evaluation of these factors leads to a more profound assessment in FLS care. This study is a systematic evaluation of comorbidities and medications associated with increased fracture risk in patients aged 50–90 years with a recent fracture visiting the FLS. In this cross-sectional cohort study, comorbidities were classified according to ICD-10 and medications according to the Anatomic Therapeutic Chemical (ATC) classification and further categorized into those associated BRR and FRR. Of 1282 patients (72% women; 65 ± 9 years), 53% had at least one BRR, 46% had at least one FRR, and 66% at least one BRR and/or FRR. At least one BRR, as well as at least one FRR were associated with age, BMI, and fracture type, but not with gender or BMD. The proportion of patients with only BRR (± 20%) or only FRR (± 10%) was similar among ages, gender, BMI, fracture type, and BMD. The combination of at least one BRR and at least one FRR was significantly associated with age, BMI, and major fractures, but not with gender or BMD. Comorbidities and medications associated with increased fracture risk are present in two-thirds of patients visiting the FLS. In addition, the proportion of patients having a combination of BRR and FRR increased significantly with age, BMI, and fracture severity. This indicates that systematic evaluation of these factors is important for a more profound assessment of subsequent fracture risk in FLS care. The online version of this article ( https://doi.org/10.1007/s00198-017-4290-y) contains supplementary material, which is available to authorized users. Fractures constitute a major health concern, as the lifetime risk of a clinical fracture at the age of 50 years is 50% for women and 20% for men [1, 2]. The annual number of fractures is expected to increase due to aging of the population . It is well documented that prior fractures in adulthood increase the risk of future fractures [4, 5, 6]. Prior fractures are associated with an approximately 2-fold increased relative risk (RR) for subsequent fractures . Furthermore, the subsequent fracture risk is highest immediately after the fracture . Hence, a fracture is an opportunity to prevent future fractures. Therefore, in current osteoporosis guidelines [8, 9, 10, 11, 12], secondary fracture prevention is recommended in all patients aged 50 years or older with a recent clinical fracture. The Fracture Liaison Service (FLS) has been identified as the most successful approach for secondary fracture prevention [11, 12, 13]. Risk factors contributing to fracture are numerous and include factors with a deleterious effect on bone and that increase fall risk or both. Some of these risk factors are potentially modifiable. There are no studies that systematically evaluated all comorbidities and medication with an increased fracture risk in patients with a recent fracture. Systematic evaluation of comorbidities and medications could contribute to specify and quantify the presence of bone- and fall-related (BRR and FRR) risk factors for fractures. In this study, we systematically evaluated comorbidities and medications with an increased fracture risk in patients aged 50–90 years with a recent clinical fracture visiting the FLS. A cross-sectional cohort study was conducted among women and men with a recent clinical vertebral or non-vertebral fracture who were evaluated at the FLS of the VieCuri Medical Centre located in The Netherlands. Identified were all consecutive patients aged 50–90 years with a recent clinical fracture visiting the emergency department from January 2009 until June 2011. All fractures were radiologically confirmed. After fracture repair, a specialized nurse screened all patients and invited those eligible for fracture risk evaluation to the FLS. Patients with facial/skull and finger/toe fractures, metastatic cancer in bone, fracture due to high-energy trauma, osteomyelitis, or failure of prosthesis were excluded. Those willing and able to be evaluated visited the FLS approximately 3 to 4 months after the fracture event. 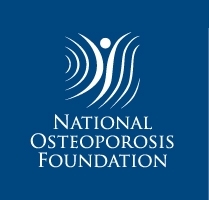 According to the Dutch guideline for treatment of osteoporosis , patients received a detailed questionnaire for evaluation of risk factors for fractures and falls, including medical history and medication use. In addition, bone mineral density (BMD) measurement with dual-energy X-ray absorptiometry (DXA) of the lumbar spine, total hip, and femoral neck was performed, and a blood sample was collected to detect contributors to secondary osteoporosis and metabolic bone disease . Laboratory tests included serum sodium, potassium, calcium, inorganic phosphate, albumin, creatinine, free tetra-iodothyronine (fT4), thyroid-stimulating hormone (TSH), serum aminotransferases (aspartate and alanine amino-transferase), alkaline phosphatase, intact plasma parathyroid hormone (iPTH), serum 25-hydroxyvitamin D (25(OH)D), and serum protein electrophoresis for all patients. At the FLS, a nurse measured height and weight and evaluated the questionnaire with special attention to medical history, medication use, and calcium intake. 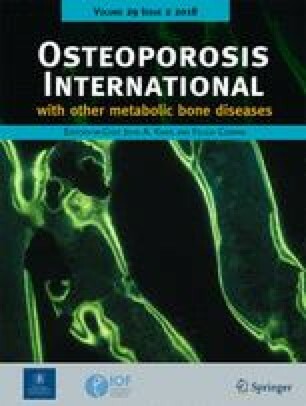 Depending on the results of BMD measurements, 25(OH)D levels and calcium intake, patients were treated with calcium supplements, vitamin D supplements, and anti-osteoporosis medication according to the Dutch osteoporosis guideline . Fractures were classified according to Center et al. into hip fractures, major fractures (vertebra, multiple rib, humerus, pelvis, distal femur, and proximal tibia), and minor fractures (all remaining fractures except fingers and toes). BMD measurements were performed at the lumbar spine (LS; L1–L4), total hip (TH), and femoral neck (FN) using DXA (Hologic QDR 4500, Hologic, Bedford, MA, USA). According to the WHO criteria , patients were classified based on the lowest T-score in the LS, TH, and FN. T-scores of ≤ − 2.5 standard deviations (SD) below the reference mean were classified as osteoporosis, T-scores between − 1.0 and − 2.5 SD were classified as osteopenia, and T-scores ≥ − 1.0 SD were classified as normal. Chronic comorbidities in medical history and laboratory tests were classified according to the tenth revision of International Classification of Disease (ICD-10) . In current osteoporosis and fall guidelines [8, 9, 10, 18, 19, 20, 21, 22, 23], comorbidities with an increased BRC and FRC risk of fractures were identified (Table 1). Medications were classified according to the Anatomic Therapeutic Chemical (ATC) classification system . In literature [25, 26, 27, 28], medication with an increased BRM and FRM risk of fractures were identified (Table 1). Opiates were not included because we could not differentiate between those used chronically and those prescribed related to the recent fracture. Polypharmacy was defined as the use of at least 5 medications at ATC-3 level in which dermatological preparations and medication that was not used chronically were not counted in determining the number of medications. Results are presented as mean ± SD or percentages. Data were analyzed using the Chi-square tests and Fisher’s exact tests. Subgroup analyses were performed for gender, age per decade, BMD (normal versus osteopenia versus osteoporosis), and fracture type (minor versus major versus hip). Logistic regression analyses were performed to adjust for age, gender, BMD (normal versus osteopenia versus osteoporosis), and fracture type (minor versus major versus hip). All analyses were performed using SPSS for Mac (version 21.0, IBM SPSS Statistics, USA). A p value ≤ 0.05 was considered as statistically significant. From January 2009 until June 2011, 3131 patients aged 50 years or older visited the emergency department with a recent clinical vertebral or non-vertebral fracture. Seventy-four patients were deceased before the invitation for fracture risk evaluation at the FLS was sent, resulting in 3057 patients being invited to the FLS (Fig. 1). Of those, 1694 (55.4%) patients were willing and able to be evaluated. Included in this study were 1282 (41.9%) FLS patients (71.8% women and 28.2% men, mean age 65.0 ± 9.4 years) that were fully assessed. Characteristics of these patients are shown in Table 2. Osteoporosis was diagnosed in 30.3%, osteopenia in 47.4%, and 22.3% had a normal BMD. According to the classification by Center et al. , 8.4% sustained a hip fracture, 30.4% a major fracture, and 61.2% a minor fracture. According to BMI, 17% was obese (i.e., BMI ≥ 30 kg/m2). Previous fractures at 50 + years, previous falls in the last 12 months, and parental history of hip fractures were present in, respectively, 31.0, 24.1, and 1.7% of patients. Previous fractures at or above the age of 50 years increased with increasing age (50–59 years: 21.6% vs. 60–69 years: 26.2% vs. 70–79 years: 40.0% vs. 80 + years: 56.9%, p = .000) and decreasing BMD (normal BMD: 24.6% vs. osteopenia: 26.4% vs. osteoporosis 43.1%, p = .000). Previous falls in the last 12 months also increased with increasing age (50–59 years: 25.5% vs. 60–69 years: 17.9% vs. 70–79 years: 24.6% vs. 80 + years: 41.1%, p = .000) and decreasing BMD (normal BMD 22.7% vs. osteopenia 20.6% vs. osteoporosis 30.7%, p = .004). A parental history of hip fractures was present in 1.7% of osteoporotic patients, 2.5% of osteopenic patients, and 0.0% of those with a normal BMD (p = .043). There were no significant differences in prevalence rates of these risk factors by gender and fracture type. As shown in Table 3, 81.0% of patients had at least one chronic ICD-10 comorbidity, 25.4% had 1, and 55.6% had multiple (up to 13). An overview of the proportion of patients with at least one chronic comorbidity per ICD-10 subgroups is presented in Supplemental Table S1. The prevalence of at least one chronic ICD-10 comorbidity was similar for women and men, and among BMD categories, but increased with increasing BMI (obese: 89.6% vs. non-obese: 79.3%, p = .001), increasing fracture severity (minor fractures: 78.4% vs. major fractures: 84.6% vs. hip fractures: 86.1%, p = .015) and increasing age (72.8% of patients aged 50–59 years up to 89.5% of patients aged 80 + years, p < .001) (Table 3). In multivariate regression analysis adjusted for age, gender, fracture type and BMD status, age (OR (95% CI): 1.60 (1.35–1.90), p < .001), and major fracture (OR (95% CI): 1.41 (1.02–1.96), p = .040) were associated with at least one chronic ICD-10 comorbidity. After additional adjustments for BMI, age (1.46 (1.27–1.66), p < .001) and BMI (1.09 (1.05–1.14), p < .001) were associated with at least one chronic ICD-10 comorbidity, whereas fracture type was no longer associated. The proportion of patients using medication was 68.1%. An overview of the proportion of patients using at least one medication per ATC medication subgroup is presented in Supplemental Table S2. The proportion of patients using at least one medication was similar for women and men, and among BMD categories, but was higher in patients with major and hip fractures compared to those with minor fractures (74.4 vs. 74.1 vs. 64.2%, respectively, p = .001) and increased with increasing BMI (obese: 78.8% vs. non-obese: 66.7, p = .001) and increasing age (55.7% in patients aged 50–59 years up to 84.2% in patients aged 80 + years, p < .001) (Table 3). In multivariate regression analysis adjusted for age, gender, fracture type, and BMD status, using at least one medication was associated with age (OR (95% CI) 1.65 (1.44–1.90) per decade, p < .001) and major fractures (OR (95% CI) 1.49 (1.13–1.97), p = .004). Additional adjustments for BMI showed that in addition to age and fracture severity, BMI (OR (95% CI): 1.07 (1.04–1.11), p < .001) was associates with using at least one medical drug. At least one comorbidity associated with an increased risk of fractures was found in 50.1% of patients. At least one bone-related risk comorbidity (BRC) was found in 42.4% of patients, with at least one BRC in medical history in 20.2% and at least one BRC in laboratory tests in 29.4% of patients. The proportion of patients with at least one BRC in medical history increased significantly with increasing age (50–59 years: 16.9% vs. 60–69 years: 19.1% vs. 70–79 years: 24.4% vs. 80 + years: 25.4%, p = .036) and increasing BMI (obese: 25.9% vs. non-obese: 19.1%, p = .031). Similarly, the proportion of patients with at least one BRC in laboratory tests increased significantly with increasing age (50–59 years: 20.7% vs. 60–69 years: 27.4% vs. 70–79 years: 36.5% vs. 80 + years: 50.0%, p < .001) and increasing BMI (obese: 43% vs. non-obese: 25.6%, p < .001). There were no significant differences in the prevalence rates of at least one BRC in medical history and at least one BRC in laboratory tests between men and women, fracture types, and BMD categories. At least one fall-related risk comorbidity (FRC) was found in 26.0% of patients (Table 3). Only BRC was present in 24.1% of patients, only FRC in 7.6%, and a combination of both in 18.3%. A detailed overview of individual BRC and FRC is presented in Supplemental Table S1. Individual BRC in laboratory tests according to age and fractures type are presented in Supplemental Table S3. At least one medication associated with an increased risk of fractures was used by 44.9% of patients, with 26.2% using at least one BRM and 32.9% at least one FRM (Table 3). Only BRM was used by 11.9% of patients, only FRM by 18.6%, and a combination of both by 14.3%. A detailed overview of BRM and FRM is presented in Supplemental Table S2. The proportion of patients with at least one BRC was similar for women and men, and BMD categories, but was significantly higher in obese than in non-obese patients (56 vs. 39%, p < .001), in patients with major fractures (48.2%) and hip fractures (44.4%) compared to those with minor fractures (39.3%, p = .013), and increased with increasing age (33.5% of patients aged 50–59 years up to 59.6% of patients aged 80 + years, p < .001) (Table 3). In multivariate regression analysis adjusted for age, gender, fracture type, and BMD status, at least one BRC was associated with age (OR (95% CI): 1.45 (1.28–1.64), p < .001) and major fractures (OR (95% CI): 1.36 (1.06–1.75), p = .016) (Table 4). Additional adjustments for BMI showed that besides age and fracture severity, BMI (OR (95% CI): 1.07 (1.04–1.10), p < .001) was associated with at least one BRC (Supplemental Table S4). The proportion of patients using at least one BRM were similar for women and men, but increased significantly with increasing BMI (obese: 34% vs. non-obese: 24%, p = .006), decreasing BMD (normal BMD: 21.0% vs. osteopenia: 24.8% vs. osteoporosis: 32.2%, p = .003), increasing fracture severity (minor fractures: 21.7% vs. major fractures 32.1% vs. hip fractures: 38.0%, p < .001), and increasing age (50–59 years: 20.5% vs. 60–69 years: 26.0% vs. 70–79 years: 32.2% vs. 80 + years: 31.6%, p = .002) (Table 3). In multivariate regression analysis adjusted for age, gender, fracture type, and BMD status, age (OR (95% CI): 1.18 (1.03–1.35), p = .019), major fractures (OR (95% CI): 1.63 (1.24–2.14), p = .001), and hip fractures (OR (95% CI): 1.98 (1.28–3.06) p = .002) were associated with at least one BRM (Table 4). After an additional adjustment for BMI, female gender (OR (95% CI): 1.40 (1.01–1.94), p = .041), increasing BMI (OR (95% CI): 1.04 (1.01–1.07), p = .016), and osteoporosis (OR (95% CI): 1.62 (1.07–2.45), p = .023) were also associated with at least one BRM (Supplemental Table S4). At least one BRR was present in 53.2% of patients (only BRC in 27.0%, only BRM in 10.8%, and both in 15.4%). The proportion of patients with at least one BRR was similar for women and men, but increased significantly with increasing BMI (obese: 65% vs. non-obese: 50%, p < .001), decreasing BMD (normal BMD: 47.2% vs. osteopenia 52.1% vs. osteoporosis: 59.3%, p = .006), increasing fracture severity (minor fractures 48.5% vs. major fractures 59.5% vs. hip fractures 64.8%, p < .001), and increasing age (50–59 years: 43.4% vs. 60–69 years: 51.3% vs. 70–79 years: 63.5% vs. 80 + years: 68.4%, p < .001) (Table 3). In multivariate analysis adjusted for age, gender, fracture type, and BMD status, age (OR (95% CI): 1.39 (1.23–1.58) per decade, p < .001), major fractures (OR (95% CI): 1.47 (1.14–1.88), p = .003), and hip fractures (OR (95% CI): 1.65 (1.07–2.54), p = .023) were associated with at least one BRR (Table 4). After additional adjustments for BMI, BMI (OR (95% CI): 1.06 (1.03–1.09), p < .001) and osteoporosis (OR (95% CI): 1.45 (1.01–2.08), p = .046) were also associated with at least one BRR (Supplemental Table S4). The proportion of patients with at least one FRC was also similar for women and men, and BMD categories, but was significantly higher in major fractures (32.3%) and hip fractures (28.7%) compared to those with minor fractures (22.4%, p = .001), and increased with increasing BMI (obese: 36% vs. non-obese: 24%, p < .001) and increasing age (16.9% of patients aged 50–59 years up to 37.7% of patients aged 80 + years, p < .001) (Table 3). In multivariate regression analysis adjusted for age, gender, fracture type, and BMD status, at least one FRC was also associated with age (OR (95% CI): 1.55 (1.17–2.04), p = .002) and major fractures (OR (95% CI): 1.47 (1.28–1.69), p < .001) (Table 4). Additional adjustments for BMI showed that besides age and fracture severity, BMI (OR (95% CI): 1.06 (1.02–1.09), p < .001) was associated with at least one FRC (Supplemental Table S4). The proportion of patients using at least one FRM was also similar for women and men, but was significantly higher in patients with osteoporosis (37.9%) compared to those with osteopenia (30.3%) and a normal BMD (31.8%, p = .040), and increased with increasing BMI (obese: 45% vs. non-obese: 30%, p < .001), increasing fracture severity (minor fractures: 29.1% vs. major fractures: 37.9% vs. hip fractures: 42.6%, p = .001), and increasing age (50–59 years: 23.4% vs. 60–69 years: 30.7% vs. 70–79 years 44.6% vs. 80 + years 44.7%, p < .001) (Table 3). In multivariate analysis adjusted for age, gender, fracture type, and BMD status, age (OR (95% CI): 1.44 (1.27–1.64), p < .001), major fractures (OR (95% CI): 1.41 (1.09–1.83), p = .010), and hip fractures (OR (95% CI): 1.54 (1.00–2.36), p = .048) were associated with at least one FRM (Table 4). Additional adjustments for BMI showed that besides age and fracture severity, BMI (OR (95% CI): 1.08 (1.04–1.11), p < .001) was associated with at least one FRM (Supplemental Table S4). At least one FRR was present in 45.6% of patients (only FRC in 12.7%, only FRM in 19.7%, and both in 13.3%). The proportion of patients with at least one FRR was similar for women and men, and among BMD categories, but increased significantly with increasing fracture severity (minor fractures: 41.5% vs. major fractures: 51.5% vs. hip fractures: 54.6%, p = .001), increasing BMI (obese: 60% vs. non-obese 43%, p < .001), and increasing age (50–59 years: 34.2% vs. 60–69 years: 43.0% vs. 70–79 years: 59.6% vs. 80 + years: 59.6%, p < .001) (Table 3). In multivariate analysis adjusted for age, gender, fracture type, and BMD status, age (OR (95% CI): 1.50 (1.33–1.70) per decade, p < .001) and major fractures (OR (95% CI): 1.41 (1.10–1.81), p = .001) were significantly associated with FRR (Table 4). After additional adjustments for BMI, BMI (OR (95% CI): 1.08 (1.05–1.11), p < .001) was also associated with at least one FRR (Supplemental Table S4). The proportion of patients having at least one risk (BRC, BRM, FRC, FRM, or any combination) was 65.6% (only BRR in 20.0%, only FRR in 12.3%, and both in 33.3%). The prevalence of at least one risk was similar for women and men, but increased significantly with increasing BMI (obese: 78% vs. non-obese: 63%, p < .001), decreasing BMD (normal BMD: 60.1% vs. osteopenia: 65.6% vs. osteoporosis: 69.6%, p = .039), with increasing fracture severity (minor fractures: 61.2% vs. major fractures: 70.8% vs. hip fractures: 78.7%, p < .001), and with increasing age (50–59 years: 54.5% vs. 60–69 years 63.7% vs. 70–79 years 77.9% vs. 80 + years: 80.7%, p < .001) (Table 3). In multivariate analysis adjusted for age, gender, fracture type and BMD status, age (OR (95% CI): 1.56 (1.18–3.18) per decade), p < .001), major fracture (OR (95% CI): 1.43 (1.09–1.86), p < .001), and hip fracture (OR (95% CI): 1.93 (1.18–3.18), p = .009) (Table 4). Additional adjustment for BMI showed that besides age and fracture severity, BMI (OR (95% CI): 1.08 (1.05–1.12), p < .001) was associated with at least one risk (Supplemental Table S4). As shown in Table 3, the proportion of patients with only BRR as well as the proportion of patients with only FRR were similar among gender, BMI, BMD, fracture, and age subgroups. In contrast, the proportion of patients with a combination of BRR and FRR was similar for women and men, but significantly higher in obese compared to non-obese patients (47 vs. 30%, p < .001), in patients with osteoporosis (40.2%) compared to those with osteopenia (29.8%) and a normal BMD (31.1%, p = .002), higher in patients with major fractures (40.3%) and hip fractures (40.7%) compared to minor fractures (28.7%, p < .001), and increased significantly with increasing age per decade (50–59 years: 23.1% vs. 60–69 years: 30.7% vs. 70–79 years: 45.3% vs. 80 + years: 47.4%, p < .001) (Fig. 2). In multivariate analysis adjusted for age, gender, fracture type, and BMD status, the combination of BRR and FRR was significantly associated with age per decade (OR (95% CI): 1.47 (1.30–1.68), p < .001) and major fracture (OR (95% CI): 1.58 (1.21–2.04), p = .001). Additional adjustments for BMI showed that besides age and fracture severity, BMI (OR (95% CI): 1.08 (1.05–1.12), p < .001) was associated with at least one risk. Polypharmacy was present in 23.2% of patients (Table 3). The prevalence of polypharmacy was similar for women and men, and all fracture locations, but was significantly higher in patients with osteoporosis compared to those with osteopenia, and a normal BMD (28.9 vs. 22.0 vs. 17.8%, p = .002) (Table 2), and increased with increasing BMI (obese 33.7% vs. 20.5%, p < .001) and increasing age from 12.8% in patients aged 50–59 years to 42.1% in patients aged 80 + years (p < .001). In multivariate analysis adjusted for age, gender, fracture type, and BMD status, age (OR (95% CI) 1.06 (1.05–1.08), p < .001) and major fracture (OR (95% CI) 1.65 (1.23–2.21), p = .001) were associated with polypharmacy. After additional adjustments for BMI, osteoporosis (OR (95% CI): 1.66 (1.07–2.58), p = .025) and BMI (OR (95% CI: 1.09 (1.05–1.13), p < .001) were also associated with polypharmacy. In this study, we systematically evaluated the comorbidities and medications in patients aged 50 years or older with a recent clinical vertebral or non-vertebral fracture visiting the FLS. At least one chronic ICD-10 comorbidity was found in more than 80% of patients and at least one medication was used by almost 70% of patients. At least one BRR was present in more than 50% of patients, at least one FRR in almost 50%, and 65.6% of all FLS patients had at least one BRR and/or FRR. At least one BRR as well as at least one FRR were associated with older age, higher BMI, and more severe fracture (major, and for BRR, also hip fractures), but not with gender or BMD. Interestingly, the proportion of patients only having at least one BRR or at least one FRR was similar for gender, age, BMI, BMD, and fracture type subgroups, whereas the proportion of patients having a combination of BRR and FRR increased significantly with increasing age, BMI, and severity of the fracture. These findings imply that comorbidities and medications associated with a bone- or fall-related risk of fractures are often present in FLS patients and that bone- and fall-related fracture risk often co-exist, especially in patients at older age, higher BMI, and with more severe fractures. Several but not all fracture risk calculators include comorbidities and medications in their models. They are implemented separately in the QFracture risk calculator , indicating that the risk for fractures increases with the number of mentioned comorbidities and medications. Apart from rheumatoid arthritis and glucocorticoid use, other comorbidities and medications are included as a combined risk factor (secondary osteoporosis, regardless of the number of comorbidities), not taking into account the number and severity, in the fracture risk assessment tool (FRAX) . Comorbidities and medications are not included in the Garvan fracture risk calculator [31, 32]. One study  investigated the number of comorbidities in relation to subsequent fracture risk and reported hazard ratio of 2.0 for subsequent fracture over 7 years in the presence of > 3 comorbidities, independent of the use of glucocorticoids (hazard ratio 1.75). Therefore, documenting the comorbidities and medications in patients attending the FLS contributes to a more profound assessment of subsequent fracture risk, but more prospective studies will be needed to evaluate the additive or synergistic effects of multiple risk factors on fracture risk. This study provides a detailed overview of comorbidities and medications in patients able and willing to visit the FLS, but these findings may not be generalized to all other patients with a recent fracture. In this study, 42% of all invited patients with a recent fracture attended the FLS. From previous studies, we know that patients who were not willing or able to have their fracture risk evaluated at the FLS were older and more frequently had a hip fracture [34, 35, 36, 37]. Consequently, in the non-attenders, the proportion of patients with BRR and FRR may be even higher. In conclusion, comorbidities and medications associated with an increased bone- or fall-related fracture risk are present in two-thirds of patients attending the FLS after a recent fracture. Additionally, the proportion of patients only having at least one BRR or at least one FRR was similar for gender, age, BMI, BMD, and fracture type subgroups, whereas the proportion of patients having a combination of BRR and FRR increased significantly with increasing age, BMI, and severity of the fracture. This indicates that systematic evaluation of these factors is important for a more profound assessment of subsequent fracture risk in FLS care. This study was supported by funding of the Weijerhorst Foundation. Dr. Vranken declares that she has no conflict of interest. Dr. Wyers declares that she has no conflict of interest. Dr. Van der Velde declares that he has no conflict of interest. Dr. Janzing declares that he has no conflict of interest. Dr. Kaarsemaker declares that he has no conflict of interest. Dr. Geusens reports grants and other from Amgen, grants from Pfizer, grants from MSD, grants from UCB, grants from Abbott, grants and other from Lilly, grants from BMS, grants from Novartis, grants from Roche, and grants from Will Pharma, outside the submitted work. Dr. Van den Bergh reports grants from Amgen, grants from Will Pharma, and grants from Eli Lilly, outside the submitted work.